The SAFER project was presented at the meeting of the CPMR Atlantic Arc Commission’s Working Group on Fisheries, held on 7 February 2018. The presentation detailed the objectives of the project and to helped to improve the knowledge of the group’s member Regions on the plans for the project and the partners involved. All of the Atlantic Arc Commission’s member Regions will receive a more detailed presentation at the Atlantic Arc Commission General Assembly, to be held on June 14 in Cantabria, the project’s partner region. 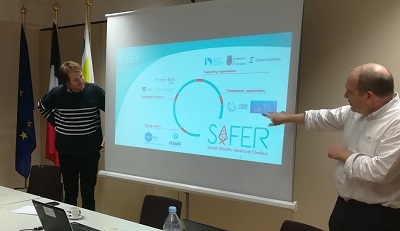 The first Safer project consists of the preparation of a referencing catalogue of innovative services on the Atlantic coast in each of the five countries of the SAFER consortium: Ireland (Letterkenny), France (Brittany), Portugal (Porto), Spain ( Cantabria), Northern Ireland (Derry). The actors from the territories who have developed innovative actions (whether technological or training for example) will be presented. As a result, they will benefit from a European showcase to reinforce cooperation. This action is coordinated by the Brittany Sea Cluster. It will provide an essential basis for the capitalisation of the project.